or Mechatronic Engineering, humourously (but incorrectly) referred to as Megatronics at times. In Afrikaans Megatronika or Megatroniese Ingenieurswese. What is it? What can you do with it? When I started studying I didn’t know, after 5 years I think I have a vague idea. So below I’m going to post what I know. In it’s simplest form it’s a combination of Mechanical and Electronic Engineering. If I really don’t feel like explaining, I simplify it to robotics. This is certainly a large portion of Mechatronics, but by no means a limiting factor. I completed my BEng Mechatronics at Stellenbosch University in 2011. The Mechatronics course was presented by the Department of Mechanical and Mechatronic Engineering in a four year course. The first two years were identical to that of those studying towards a BEng Mechanical. The first year course is identical for all engineering students. In the third and fourth years, the two courses still followed similar routes, with the Mechatronics course replacing several Mechanical courses with some courses presented by the Department of Electronic and Electrical Engineering. In third year these included Electronics and Computer System’s courses and fourth year Electronics and Electronic Design Courses. Losing out on some Strength of Materials and Thermo-Fluid Mechanics. The most important difference between the mechanical engineering programme and the mechatronic programme is that mechanical engineers are equipped to develop mechatronic systems with existing controllers (computers, PLC’s, etc. 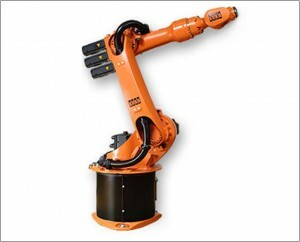 ), while mechatronic engineers are also equipped to develop specialised controllers (e.g. for embedded controllers) and the relevant electronics themselves. At the time, the Head of Department felt that Mechatronics as an entity was still too new. Employers weren’t advertising for Mechatronic Engineers, and didn’t really know what to do with them when they did get them. This resulted in the close ties between the Mechanical and Mechatronic courses. I was often unhappy about this, having would of preferred more focus on the Electronics, but in the end it worked out. And the HoD’s opinions were/are valid. When I chose Mechatronics, I didn’t know where I was going to work, I chose the course because it sounded interesting. It wasn’t until my final year that I found a direction to work towards. Course setups at different universities are going to be different, and will put emphasis on different subjects, that doesn’t necessarily make one better than the other. Either way you’re going to come out of it with a degree and a fair amount of knowledge. Most importantly though (and this is true for any engineering degree) is you’ll know how to learn. I’m quite confident that specific things that I learn in my first year of work will be of more value to my career than a specific subject at varsity, but having struggled through several subjects, I know I can figure out most things that come my way. I know where to look and how to go about solving problems. In my final year we were a class of 85 Mechanical/Mechatronic students, of which I’d say about 30-35 received their BEng Mechatronics in 2011. NMMU have a slightly different setup. 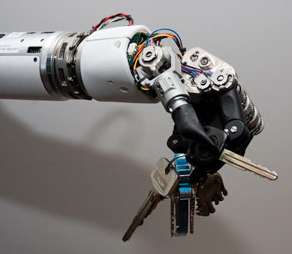 Mechatronics is presented by the Mechatronics school of the Department of Engineering, the Built Environment and IT. Mechatronics is the only Engineering degree they offer. As such, first year physics and maths are taken alongside BSc students and after the first year, courses taken are aimed only at Mechatronics students. The format of the course is still identical to that of when it started giving a good balance of subjects. The University also offers an array of BTech degrees in other Engineering fields. I’m currently pursuing my master’s degree at NMMU. Their 4th year BEng Mechatronics class has roughly 25 students in it and the 3rd year class about 30. First year applications are limited to 60, with the most recent 1st year class starting with 50 students. The Mechatronics department is currently sponsored by General Motors South Africa (who have a plant in PE) and also have close ties to the Volkswagen plant in Uitenhage. Mechatronics as a career is still finding its feet. Meaning many consider it a jack of all trades, master of none type of situation, and although the course may feel that way, it’s certainly not the end of the story. Mechatronics isn’t a new field, it’s just finally been given a name. When you tell people you’re a Mechatronic Engineer they don’t know what that is. I had a month stint at a large production facility as part of vacation training and I was asked to choose between focusing on their Mechanical or Electrical divisions, eventually settling for a bit of time at each. But that’s how businesses in SA are structured. This will change. Several Mechatronic Engineers that I know have taken up Automation maintenance posts. Nothing wrong with this, personally it’s not where I want to be. Contrary to this though, my first job next year will be in automation maintenance. I however plan to use this as a stepping stone into a design career. Automation is fun, and whereas I am going into automation in a production sense, automation also relates to smaller and/or more technical situations. 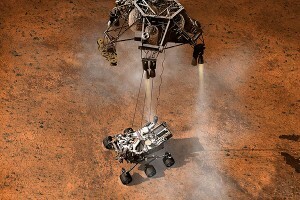 The recent landing of the Curiosity rover on Mars is a perfect example of Mechatronic systems. There are several elements here, from the automated landing system to the remote control of the device. In the motor industry, systems such as traction control, ABS and ESP are all examples of Mechatronic systems. Heavily complicated systems that rely on the processing of data from sensors to enable control of actuators. As such a Mechatronic Engineer can make him/herself home in many different industries. These include the Automotive, Aerospace, Manufacturing, Medical and Communications Industries. So what do you do when you have your degree? You do whatever you want. You’ll find something. I’m not aware of any of my colleagues who are currently not pursuing a post-graduate degree or are employed. Not all of them are in Mechatronic specific posts. Some have opted for more mechanical orientated jobs, while others have gone entirely into areas such as electronic design or programming. And that’s one thing, a degree in Mechatronic Engineering in no way limits you. Very few engineering degrees will actually. Note: Although other institutions may offer courses in Mechatronics, or Mechanical Engineering with a focus on Mechatronic elements, the ones listed above are the only ones recognised by ECSA for registration as a mechatronic professional. Information was correct at time of posting, but may have changed since. There are also several Universities of Technology and FET Colleges which offer courses in Mechatronics. CPUT is one of these institutions. Another training institution is Umbilo Training Specialists in Durban. They are running a free training course, once a month where anyone can come to learn more and expand their knowledge. Checkout their page for details. For some more reading and a very complimentary view with some poignant remarks have a read here. As part of my degree at Stellenbosch University I completed a project which can be seen here. As part of my master’s degree at NMMU I completed a project which can be seen here and here. If you’re looking for bursaries, try this website. Much of what is stated comes from my own experiences and conversations with relevant people. This entry was posted in info, Opinion and tagged Automation, ECSA, Mechatronic Engineering, Mechatronics, Megatronics, NMMU, Robotics, Stellenbosch University by Gareth. Bookmark the permalink. Hi Gareth. This is Siphosethu and I’m currently doing scimathus, a year long bridging program in Stellenbosch University. Before coming to scimathus I wanted to pursue a career in electrical engineering, however I also liked mechanical but my interest fell on electrical, but now I’m considering mechatronics.. Between the three varsities you mentioned which would you advise a student to go to, reasoning in terms of getting nationally​ recognized degree and other reasons? I generally don’t advise a specific university. I did my undergrad at Stellenbosch, and am thus heavily bias towards it. If you enjoy your year there, I suggest staying, it’s a great university. But that doesn’t mean that UCT and NMMU aren’t. All three offer an ECSA approved course, so on paper the degrees are equal. As far as reputation goes, that is generally more subjective and based on an employer’s opinion, but when working with larger organisations this is less of an issue. Sorry I can’t be of more help, if you have specific questions you’re welcome to send me a mail via the contact page and I can try answer in more detail. How many points are required in my matric statement for me to qualify to study mechatronics? Hi Mokgadi, requirements change year by year and are different for different institutions. You should check with the admissions guidelines for the course and institution you are specifically interested in. Hi Gereth I’m Siphephelo,I’m currently doing grade 12 this year and I’m interested in mechatronics.I was thinking of doing it in DUT but they only offer a National Diploma, So I would like to know if I have a diploma what are the chances of landing a good job after I’m graduating? Hey Siphephelo, it depends on the kind of work you want to do and where you want to do it. With a diploma in Mechatronics, you can definitely get get a good job, but you would have to be willing to move, and maybe not do the kind of work you want to do, but that is perhaps true of any qualification. Mechatronics gives you a good amount of scope, and with a successful internship you should be able to get a good job. I am an S3 Mech drop although had love for Elect. Want to restart and do Mechatronics but due to work part time will be convenient for me but now I see that unisa is scratch out from the institutions can you explain. I have been doing a degree in BCom Chartered Acoountancy, my life is miserable as we speak and I’m failing and wasting money and time cause since childhood I’ve been obsessed with designing and drawing. I wanted to study Mechanical Engineering but my marks for Physical Science were pretty bad (56%) and my math came out as 62%, I got rejected by varsities, I wanted to do a degree in engineering not a diploma so I ended up choosing CA but honestly I’m not happy because my creative design ideas keep haunting me every day and I don’t focus in class, I would take a pen/pencil and design some cool machine or invention I would like to design to change the world. I’m very interested in Mechatronics, it appears to be the passion I’ve been looking for according to your statement. I’m sorry to hear you weren’t able to get in for an engineering course, and are not enjoying your current study direction. How far into your CA course are you? If you’re still in your first year, my suggestion would be to study hard (as much as you don’t enjoy it) and try to get good marks. This will help you if you then choose to switch to an engineering degree at the end of the year. If you can show that you work hard, and can succeed at university, they are more likely to let you in regardless of your matric marks. Further than that I don’t think I can really help. If you get into an engineering degree, just be warned, it’s not all exciting and design work, lots of the work is quite boring as well, but at the end of the day if it’s something you’re interested in you can work through it. I hope you come right, either in switching courses, or finding meaning in your CA course. Hi Gareth I just want to say that thank you a lot. I sent you comments last year and you kindly replied on them. I am currently at Stellenbosch and studying towards my degree as you did. please give me some advice on studying and what to expect as the years go on. I’m so glad to hear that, I hope you’re enjoying the course. For me it got better as the years went on. The subjects were more interesting, a bit more focused, and less generic. As for advice, just stay up to date with your work. If you don’t understand something, ask for help as soon as possible. The later you leave it, the more you have to try catch up later. Enjoy your time in Stellenbosch, it’s a really nice town with lots to offer. Hello Ronewa.This is Siphosethu. I see that you are very passionante about this mechatronics, big up on that. This year i will be commencing my engineering studies in stellenbosch uni. i hope and pray that i see you on campus this year so that mybe u can pass on the advices from ur new experience and what u went through last year. Hi Zelda, well done on completing your level 4. I’m sorry to hear about the finance issues as you seem to have things figured out. Having your NQF4 is a good start, and does give you some options into getting an internship, although you say it’s been difficult. Studying as you’ve done is a good alternative. Have a look here: https://bursaries-southafrica.co.za/bursaries-for-engineering/ to see if there might be some funding opportunities to let you study further. With your background I think you’d be a good candidate. Greetings, Just read your blog man I want to enroll for a MEng at nmmu do they calculate your overall avarage mark for selection or as long as you hold a BEng you qualify?also is it difficult to get a job overseas if you’re an average engineer in contries like USA, UK ,German etc? I’m not sure currently, but usually for acceptance to a Master’s degree they expect an average undergraduate score of 60%. This isn’t fixed though, and if you can provide other motivation that you would be able to complete a Master’s degree, it can be lower. As for getting jobs overseas. SA degrees are recognised overseas, but unless you already have citizenship in one of those countries, it will be difficult to get a job unless you have some experience which makes you uniquely qualified. I’m an IT System Developer by profession who is now interested in Mechatronics. I’m based in Gauteng and i found out that other universities (in Gauteng) not mentioned above offer Mechatronics as a Module and not as a Course. But again, you NBd that the ones listed above are the only ones recognised by ECSA for registration as a mechatronic professional -which is my main goal to be a recognised Mechatronic Professional. -In short, I wanna complete a BEng Mechatronics like you :-) but I’m based and working in Gauteng and Stellenbosch, NMMU and CTU are not practical for me. TUT offer it as Mechanical and Mechatronics. UNISA offer it as Electrical Mechatronics. Which one between the two would you suggest i go for? I’m afraid I don’t know much about either the UNISA or TUT courses. The UNISA course will have the advantage that you can prbably do a lot of it part time, or atleast without having to attend lectures. This might be an advanatage if you’re wishing to continue working while you study. Both offer it as BTech, and should have similar coursework. Don’t forget that a BTech still lets you qualify as a Professional Mechatronic Engineering Technologist. Thank you man, really helpful! is it possible to become an engineer at another university after doing a general bsc @unisa, perhaps an honors in engineering? If so, how many years of further study is required? I prefer home study, but don’t want to do a diploma course. I like the bsc as it is internationally recognized. I’m not sure on the details. If you’ve done a 3 year BSc course, there are some BTech courses offered which can be done as a single year extension. If you decided to do a BEng, you might be able to get some credits from your BSc, but will probably have quite a lot of work to do. If you first completed a relevant BSc honours, you might be eligible for certain MEng degrees. If there are specific courses you are interested in, it’s best to contact the instutions directly to discuss entry requirements. I am currently doing Grade 11. I am interested in Mechatronics as well. I want to do BSc Eng Mechatronics. But honestly speaking I am scared. At first I wanted to do mechanical engineering but after I learned about Mechatronics I was interested. I want to try Stellenbosch university. So can you please tell me what I should expect there if I get accepted? Also, when I do a BSc Eng Mechatronics, if I want to study further then what will I be studying, Masters or Honors? Do you have to have an idea of what you want to do after studying before applying for it and know what you’re going to invent before the course or all f that can be discovered along the process? Lastly, my fear in Mechatronics are the combined courses that have electronic in them. How can I overcome that fear or what should I do in order for me to understand ‘Electrostati circuits’? I really wanna try Mechatronic Engineering so please help me. I need advice. What all are you wanting to know about? As far as studying is concerned, you will encounter similar experiences regardless of where you study. Your first year at Stellenbosch, all engineers follow the identical course structure. This is good to know, as it means, even if you sign up for Mechatronic Engineering, at the end of your first year you can select a different course. The first year is a combination of maths, chemistry, mechanical engineering and electrical subjects. Second year Mechatronic engineering is identical to Mechanical Engineering, so again at the end of your second year you can choose to go straight mechanical if you’re concerned about Mechatronics. 2nd year includes a combination of maths, mechanical engineering and electronics. 3rd year is the first time you diverge in any significant way, doing more electroncis and computer systems courses, while still taking about half mechanical coursework. The fourth year is the same. Stellenbosch offers a 4 year BEng degree, effectively including an honours, which is standard for SA universities. From there you can start straight into a Masters. I didn’t really know what job I wanted when I started studying. I couldn’t decide between Mechanical and Electronic Engineering, so took this, viewing it as a middle ground. Even since I’ve started working, I’ve had quite different jobs, neither completley what I intended to do when I was nearing the completion of my studies. To a large extent Electronics is just maths. You’re going to do a lot of maths in your first two years, and you’ll most likely have to work quite hard to get through them, but they do prepare you for a lot of the electronics work. I don’t think you should fear electronics. If you know it’s somethign you’re not good at, at least you’re able to identify that and take steps to address it. A lot of university is about understanding your limits and how to deal with them. But electronics is not notably more difficult than other subjects such as fluid mechanics or thermodynamics. You’re provided with the tools and instruction to complete the problems you are expected to solve. If you struggle, there is help available to you. And if this is something you really want to do, then it’s worth putting in the time and effort to learn. Let me know if you have any further questions. And good luck.